Compton Youthbuild Receives Ronald McDonald House Community Grant - EntreNous Youth Empowerment Services, Inc.
On a Beautiful June evening, a group of distinguished individuals gathered at the Long Beach Ronald McDonald House to celebrate the 30th Anniversary of the Ronald McDonald House Charities of Southern California’s (RMHCSC) Community Grants Program. 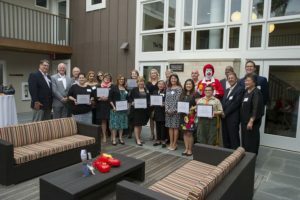 This evening was also to showcase eight of our regional non-profit organizations that are the 2016 recipients of the RMHCSC Community Grants program. Since 1987, the Community Grants Board has awarded more than 900 grants totaling more than $24 million to Southern California organizations that directly benefit children and families.